As social media grows in importance and usage, so does a standardization of it. However, placing social media in a box can go against its core value, relationship building. Since relationships are not built through set standards, but through interaction and understanding; these need to remain the main focus for anyone doing social media. Structure helps to set a course and is necessary when social media is used in a business scenario. 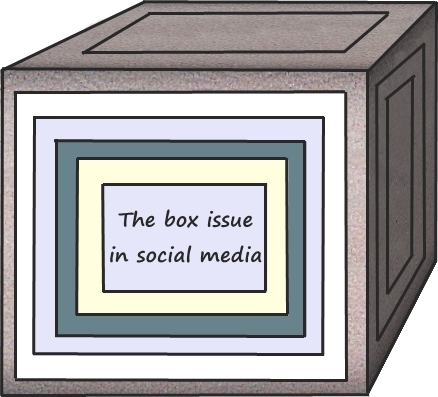 The need for a fixed start and end point help to know what direction is being taken and how to measure; in fact, the intent of the social media box is just this. Solely organizing social media sharing (according to the outlined scheme one has learned through verified sources in the field). Some of these set standards include tweeting and posting a certain number of times a day and the percentage of social versus lifestyle content to share. Next is being told to engage so often throughout the day, to increase following and keep an eye out for scores that give you status, such as the renowned Klout score. The above items are great to apply, but too often they are considered doing social media. Automating shares, providing the necessary content and increasing numbers (whether followers, likes or Klout score) are components of the efforts social media entail. These need to be used alongside the genuinely caring and building a relationship part of what doing social media is really made up of. Don’t only retweet, like or reshare content; but also read, comment, and initiate an actual dialogue on topics of interest. Consistent contact and wishing a good day can show ‘I care’ (and not only with influential contacts for the sole purpose of growing popularity). Although defining is inevitable, it is necessary to avoid getting lost within the lines and making what was meant as guidelines the end objective. An effective fix to this inclination is to simply remember that all the social media boxes out there are a means to gauge a business’ social media efforts, but that doing social media and succeeding in it lie within the human component.